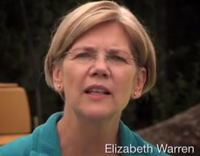 Elizabeth Warren Loves China Ad, Really? What is it with the left and their admiration for China? Elizabeth Warren's most recent ad claims we should be more like China since they build a lot of roads. This is the same Elizabeth Warren whose claim of being part Native America got her a minority status at Harvard, even with her blonde hair and blue eyes, and who influenced Obama famous “You really didn’t build that” speech. I will give Warren credit, she has no problem in claiming her roots as a true lefty, and Massachusetts is one of the few states where "let be like China" might actually sell. The ad should give one pause on the direction of where the Democratic Party is headed. In two previous columns, I pointed out this trend with another noted leftist. Andy Stern, the former head of the SEIU, wrote a piece calling on America to be more like China. Stern even observed that any economic activity must be done with the approval of the Chinese government; and while the Chinese may have opened up their economy, they view property and economic rights as gifts provided by government and economic outcome determined by the government. New York Times columnist Tom Friedman asked, “What if we could be China for day. Where we could actually authorize the right solutions… I want my democracy to work with the same authority, focus and stick-to-itiveness. But right now, we have a system that can only produce suboptimal solutions.” Friedman's point is that wouldn’t it be wonderful to have Obama be dictator for a day? What is disturbing about the Warren's ad and Obama famous “You didn’t build it speech” is the assumption that economic growth begins with government, and economic activity needs to be directed by the government. For Warren and Obama, their entire focus is to direct economic energy toward goals they approve of. This philosophy was seen in the action of ACORN, an organization that attempted to browbeat banks into loaning more to minorities and urban communities, an organization that a younger Obama worked with. (The ACORN objective was to increase economic activity in urban areas, but actual market reality for these loans was never factored in. This was one of the factors that led to the financial meltdown in 2008.) The goal then as now forces corporations to direct investments in areas the left believed it should go and ignore the market. The Warren/Obama thesis is that economic development needs to be directed by the state and not by the market. The left distrusts the markets and views market economy as an obstacle to obtaining the greater good. In the Warren/Obama world, unless government builds the roads, no private development can happen. It never occurs to them that maybe the revenues to build the roads come from entrepreneurs who build the businesses that hires the people who then pay the taxes to pay for the roads. No roads get built or no schools are open without the prosperity provided by the entrepreneur who risks it all. Our Founding Fathers believed that economic freedom was a necessity and an important foundation to build a just society. As writer PJ O’Rourke once noted, the Constitution predisposes a limited government including free market economics. It is considered gauche to call Obama a socialist but one has to ask the question: If Obamanomics is based on a premise that government determines economic growth and that economic growth needs to be directed by the government, then what is Obama but not a socialist? Obama believes government is the driving force of progress, whereas Romney deep down views government as but one player in a greater society and not the dominant factor behind society. That is the crux of the debate we face. When you see politicians viewing China as a model because “they build roads,” then maybe you have to question if those politician can be trusted. Warren's love for China shows a politician who has no true understanding of the limits of what government can do. That is enough of a reason not to elect her to the United States, or for that matter, the man on top of the Democratic ticket for another term.